My post last Friday (Super Mom Debunked) focused on some of the simple things in life and the importance of enjoying them as parents. Being part of a family is hard work sometimes! Things aren't always simple and sometimes we need more tools as parents (and adults-- since we are more than just parents, right?). 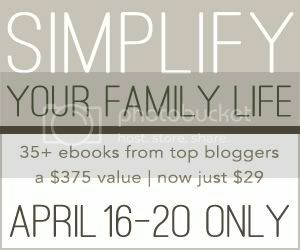 This is why I am so excited to introduce the 2nd Annual Simplify Your Family Life Sale! 35+ resources all in one place to help you simplify your family life! Over the next few days I will be sharing a few awesome resources on our Facebook page and on the blog about simplifying family life. If you're looking for a few more tools... I highly recommend checking out all of the amazing ebooks listed below that you can buy for a total screaming deal. Corey from Simple Marriage and Mandi from Life...Your Way have brought together some of the top authors in the family life space with 38 ebooks covering a variety of topics related to family life. This collection is only available from 8 a.m. on Monday, April 16th to 8 a.m. on Friday, April 20th. There will be no late sales offered. The sale ends at 8 a.m. ET on April 20th, and there will be no late sales offered, so don't wait. That was weird Amber! I changed the links and they should be working again! Hope that works! this looks great! might have to take a week off blogging to read them all! :) and i just sold a print on my etsy shop, so i can totally do this now! Hi! I bought the books but I haven't got any confirmation nor any link to download the books from in my email address. I saw the confirmation that it was succesful and charged to the credit card I used. Hope you could help me with my problem. It has been more than hour already. Could it just be a little slow?